Ever since we adopted our dog, Lucky, I've been thinking about decor for dogs. I think Lucky would appreciate having a dog "nook." You see, Lucky likes to curl up in small spaces. At the first sound of thunder, he can be found in the closet. Or, if he's afraid you're leaving without him, he jumps in the car and plops himself down under the driver's seat. He seems to feel safe in small, cozy places. 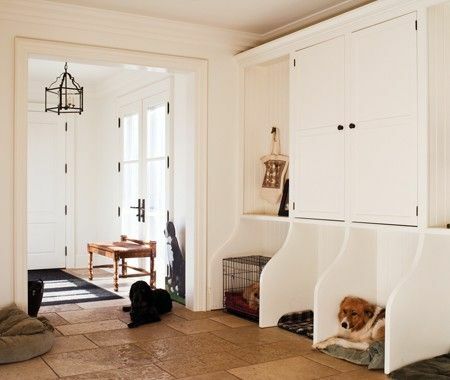 So perhaps a designated dog nook is in Lucky's future. 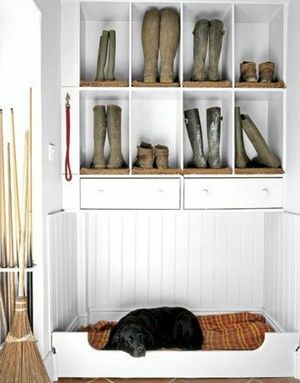 Does your four-legged friend have a designated nook? Our Murphy goes into a tight little corner that is made where our sectional curves around the corner, or she is sprawled out in the dining room! Those are some pretty sweet spaces, but my favorite pic is Lucky in the car! So sweet! OHHH this makes me miss my Boston Terrier, Rocky who passed away about five months ago...I loved finding him stylish dog beds at Home Goods. But his favorite place was curled up on the couch next to whoever was there. Rocky liked our closet, too, during fireworks on the fourth of July. Our Martha used to love curling up on her pillow under the wing chair during storms and bedtime. The rest of the time, she sprawled herself out across the back of the sofa like a cat. :) Lucky looks so cute in the car! Awe, I love this post, Carolyn. Lucky is so cute! I think most dogs do love cozy spots, mine always have. And on the 4th of July they are stuck to my leg! Lucky is my kind of cute dog!!! LOVE those big eyes!! 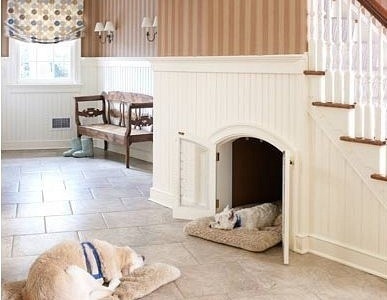 Great post, I have my forever dog Mesa and a foster dog Shelly right now, so a creative dog zone to get the beds off the floor would be a welcome addition!! Great post! I have two springers that are like my children;) They are both babies and feel so sad when left alone so I try to take them with me to run errands if I can. Dogs are pack animals and they love to be around all the action. Having a little nook for them (in the middle of all the chaos!) is perfect. Great pictures! 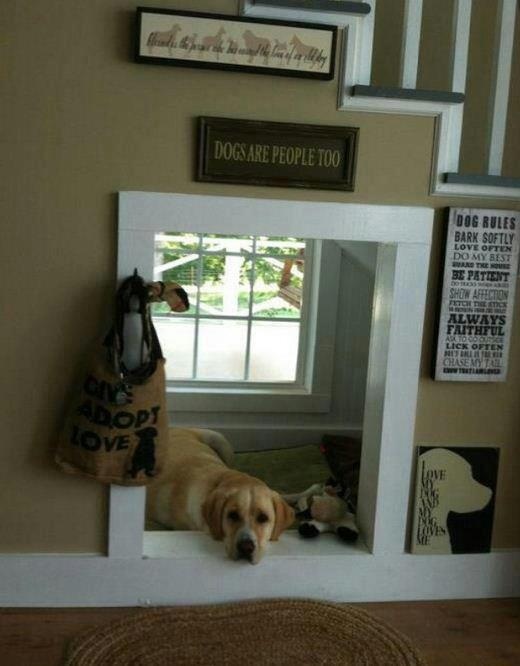 Great idea...I would love to have a dog nook that my dog would use!